A well-trained dog and handler will be able to pinpoint where bed bugs are in your home. 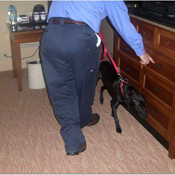 A professionally trained dog can be 95% or more accurate in sniffing out bed bugs. If you think you may have bed bugs you should act as quickly as possible to determine if you do or not. That can only happen with an inspection by a professional unless you have already positively identified a bed bug and can show it to a professional exterminator. You must have evidence or any ethical pest company will not treat your home, and with good reason because powerful pesticides are often used to kill bed bugs. In the Portland and Seattle, you can now find several bed bug sniffing dog companies that provide inspections to homes and businesses. Be sure if you have a bed bug dog inspection that any positive hits are immediately followed by a physical inspection where bed bugs are found. Physical evidence of bed bugs is critical for effective treatment. Interview the company or handler before you pay. The cost of a bed bug dog inspection can range from $150 to $300. You will feel more confident of the result of the inspection if you remove clutter so the dog can do its job. Ask where the dog was trained and ask if you can see the dogs documentation proving it was trained at the facility you were told it was. There are several reputable training schools now, and just as many fake bed bug dogs. Then do a quick internet search for the school where the dog was trained. You can call the school and ask about the specific dog. Dog training schools should be ok confirming a bed bug dog was trained there to protect their reputation which can be ruined if people lie about where their dog was trained and then fail to find bed bugs. Unfortunately, there are people who see they can make a lot of cash selling their dog as a trained bed bug dog. The dog will alert to the area the bed bugs are in by sitting or pointing. If the dog alerts positive, insist the inspector find physical evidence at that time. This will ensure you do not pay for treatment based on a false positive. Physical evidence can be bed bugs, their castings or eggs. Bites do not constitute evidence of bed bugs, but can be a reason to schedule an inspection. You are looking for a company that doesn’t rush through the process or try to conceal their methods.